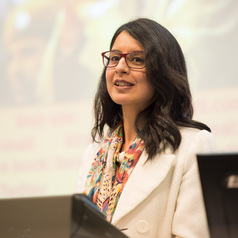 Sukhmani Khorana holds a PhD in film studies from the University of Adelaide. Her doctoral project involved a holistic study of diasporic cinema, as well as a manifestation of the same in the making of a documentary about Indian migrants. Her current research looks at cross-platform refugee narratives, diversity in film and television, and food in inter-cultural contexts. With Prof Kate Darian-Smith and Prof Sue Turnbull, Sukhmani holds an ARC Linkage grant examining migration and television in Australian. She also has a new monograph on food and cosmopolitanism, published by Rowman and Littlefield International. Sukhmani's teaching spans global media, screen studies, media ethics, qualitative research methods and intersectional cultural studies.